We’ve been boing-boinged a second time for Dance Dance Immolation. The first was back in 2005 when DDI was in it’s infancy. Fast forward 4 years and this time DDI is a bit more polished. BB has a video put together by Eddie Codel, hosted by SFSlim and Charis Tobias and starring the various members of Interpretive Arson. Yours truly is in it for only a moment, but it’s one of those most wonderful moments where Rubin and I are hitting the buttons that makes the fire go! The video was all filmed during our setup and run for How To Destroy The Universe Part 6. You can check out the official post on Boing Boing. If you had any doubt that we were living in the future, we’re no longer at the “let’s try to build a jet pack” stage. Now we’re trying to see how fast they can go. This past weekend, a Go Fast Jet Pack Pilot named Eric Scott set the world speed record for a jetpack: 68mph. He even raced it against a Ford Focus and narrowly beat the Focus. Eric Scott is no stranger to world records when it comes to jet packs. He also holds the world record for height (1,053ft) and distance (1,500ft) with a jetpack. The Go Fast (I swear, that’s their name!) Jet Pack is surprisingly environmentally friendly. It is not a combustion engine, and actually uses hydrogen peroxide, precious metals, and super-heated steam to give about 800 horse power for 30 seconds. Oh, and it’s loud, clocking in at 130 db. 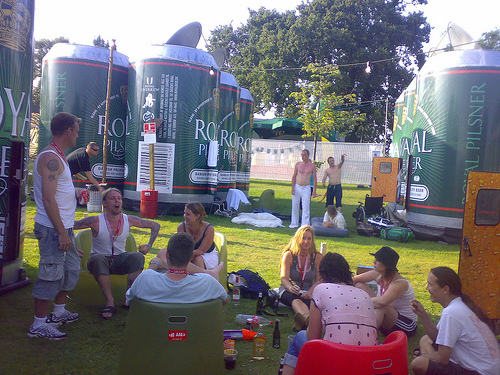 With large multi-day festivals one of the problems is where everyone goes to sleep at the end of the night!� Sometimes the festivals are located near hotels, but a lot of the time you’ll find a sea of tents housing everyone.� But the organizers of Smukfest, a large music festival in Denmark, hit upon a novel idea: after spending all day drinking beer, why not sleep in a can? 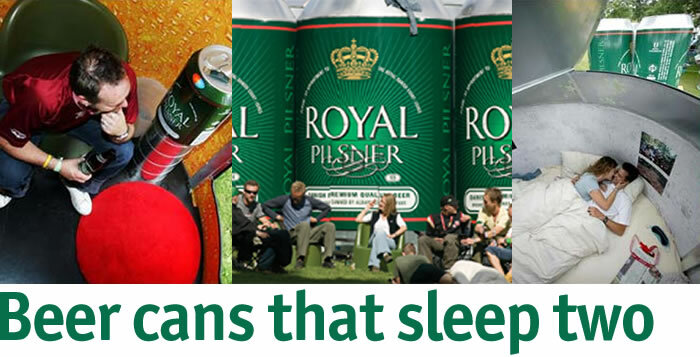 The giant cans (11.5 feet high and 7.2 feet in diameter) are dubbed “Can Sleeps” and have a lockable door, a refrigerator and a roof that opens for light and air.� Inside you’ll find all the comforts of home, a refrigerator (can shaped of course), tables, chairs, mirrors, shelves, etc.� The bed itself is lofted and comfortable large enough to sleep two adults.� All of the furniture is of course from a nearby neighbor, the Swedish Ikea.� Currently Royal Unibrew has a contract on them, but in the future I’m sure more brands will start jumping on the wagon.� It’s a wonderfully unique approach and I can’t wait to see them when we take Dance Dance Immolation to Denmark for this year’s Smukfest.� And yes, they do come in six packs. Thanks to Springwise for some translation. Want to make your own ambient Kutiman mixes? Thanks to the work of Darren Solomon of Science For Girls and several YouTube contributors you can (as long as you like Bb). The project is called “In Bb 2.0” and can be found at www.inbflat.net. Darren put out a call for people to post YouTube videos of them playing instruments (or singing) in Bb major. He gave some guidelines on what works best, but left it open for people to be creative. The result is incredibly fun. 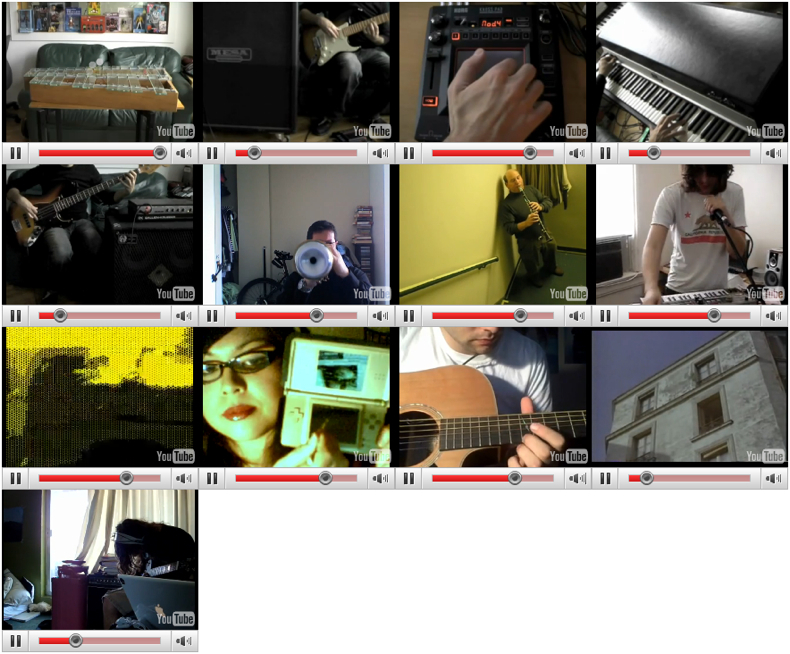 You can play all of the videos at once, or just a few. Try playing a couple, and then bring in a few more, adjust the volume, start/stop, etc. The resulting sound has an incredibly pleasant ambient quality. Rather than a mash up where things were forced together, it flows incredibly well regardless of which video you play and when you start playing it. I’m also very fond of the spoken word video. If you want to contribute to the video, Darren outlines the guidelines on the site. He’s not putting every video up because he wants to maintain the feel of the project. I agree with his choice as I’m not sure Rap Chop would really work. 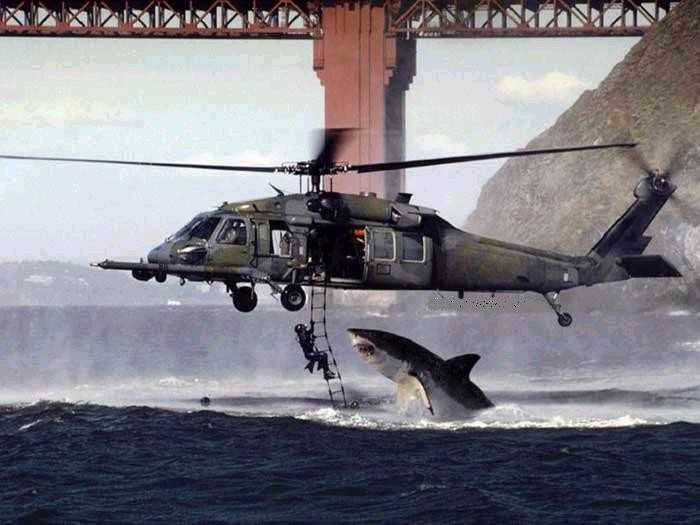 Ever wondered what it would be like if a gigantic shark and a humongous octopus battled it out in the waters of the San Francisco Bay? Neither have I, but after seeing the trailer I couldn’t resist pre-ordering Mega Shark vs. Giant Octopus, the straight-to-DVD-movie with Debbie Gibson. It’s a flick from The Asylum, a company with a large amount of movies with strangely familiar titles. Wondering how big “Mega” is? 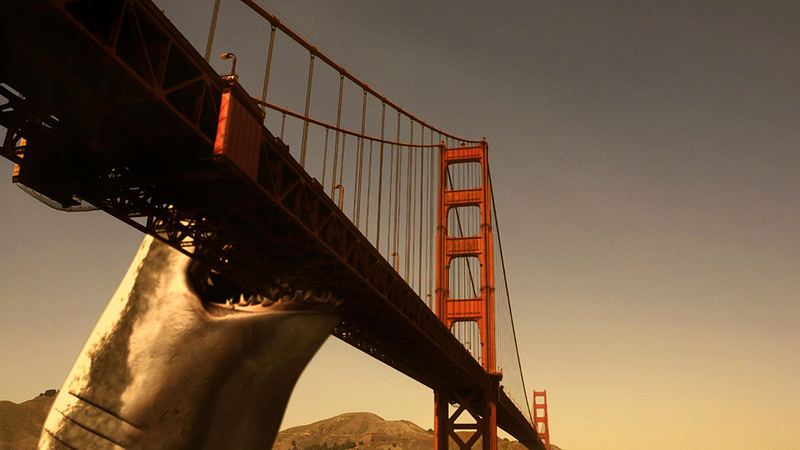 Here’s a still from the movie of Mega Shark attacking the Golden Gate Bridge.� Needless to say our favorite Bay Area shark is put to shame. As someone who has a problem with both electronic music and technology, the Tonium Pacemaker seems right up my alley. It’s never going to replace a truly talented DJ and luckily the creators recognize that. However, thanks to the lower price of entry ($499 for the 60GB version), it can bring more people into the world of mixing music. I’ll be honest, I’m torn. I don’t know whether to whine about the purity of vinyl, or to go out and buy a Pacemaker. But I do know that if I was to get one it sure would take up a lot less space than the two Technics + a mixer + cabinet of records. My big question though is how well does it deal with jungle/drum and bass tracks? I can’t wait for the My Little Pony Live Action movie to come out. Definitely file this one under “Don’t Try This At Home” or even “…At NIMBY”. The above video is a wonderful example of what happens when you pack gunpowder into a pipe and then top it off with thermite. It’s a beautiful mushroom cloud of molten metal that you’ll want to be far away from when it goes off.